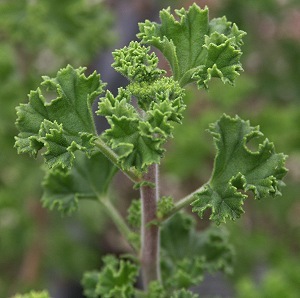 Tall and spiky, Lemon Geranium is one of the smaller leaved (about the size of a fifty-cent piece) Scented Geraniums and is ideally suited for container growing. 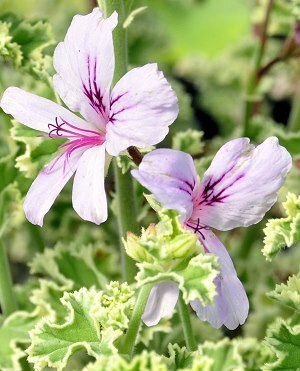 Lemon Crispum is one of the most often used Scented Geraniums for cooking. Most often it is used to scent icing sugar. Tear leaves in half and add to the sugar the day before. Remove leaves before using the sugar to make the icing. Although pale and small, the flowers of Lemon crispum are still beautiful. They make a delightful addition to a salad or nice cold glass of iced tea. Freeze them in ice cubes for a fun visual effect. A smaller version of Lemon crispum is the tiny leaved Fingerbowl Scented Geranium. Both of these can be used to scent water for cleansing. Leaves are more commonly used for this because they contain the refreshing lemon oil. But, the flowers add a quaint Victorian touch to fingerbowls or baths. 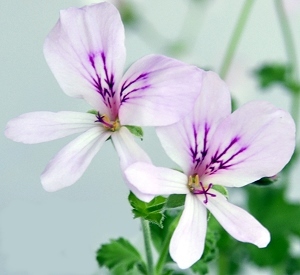 Now take Lemon crispum and make it variegated and you have Prince Rupert Scented Geranium (pictured below) with the same refreshing lemon scent and growth habits. 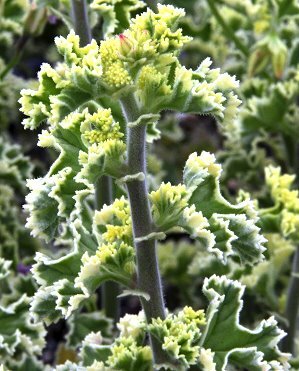 Like most variegated plants, Prince Rupert has a highlighting affect when planted among dark green plants. Both Lemon crispums would make a welcome addition to our Gourmet Herb Garden Six Pack.